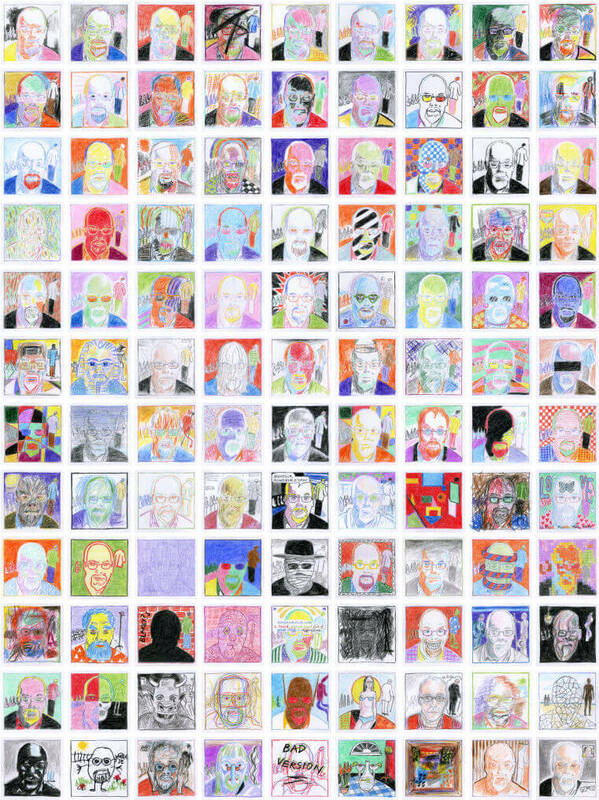 I present here a personal selection of portrait paintings and drawings created since 2006. What is a portrait? The scope for experimentation is vast. “Painters have only nibbled at this marvellous jumble of a world” (Frank Auerbach, speaking in 2009). With portraits I am striving not for exact likeness nor for capturing an essence or soul; I regard the people I portray as physical objects, albeit of a special order: objects animated by a life-force and exhibiting the unique self-awareness, emotional charge and narrative drama of the human condition. 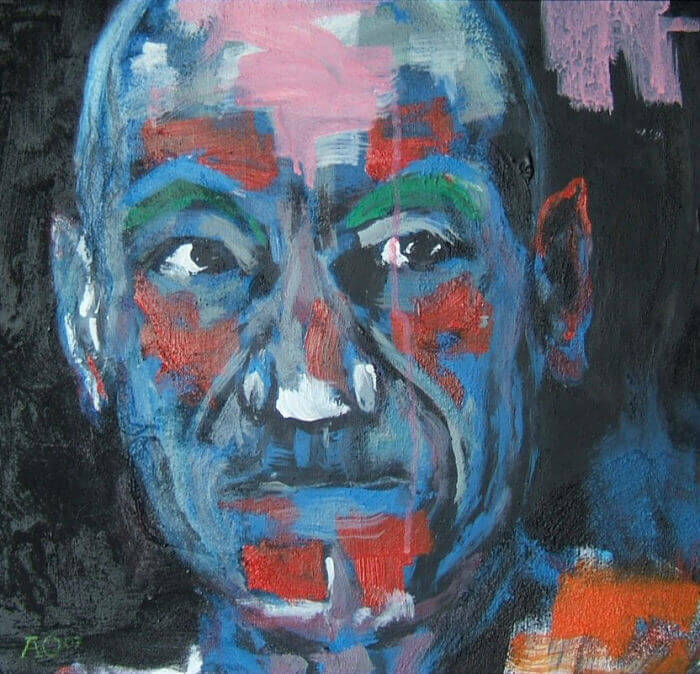 My portraits emerge from electrified special encounters or from studies gathered for projects covering wider themes. 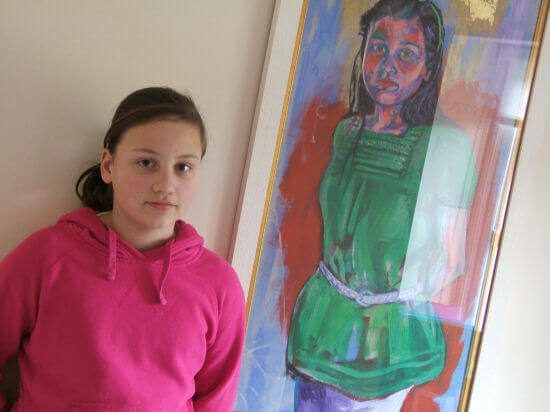 This painting is a life-sized portrait. The work is the fifth panel in my on-going series "Sentence". The man in the work is a prisoner and the woman his wife. 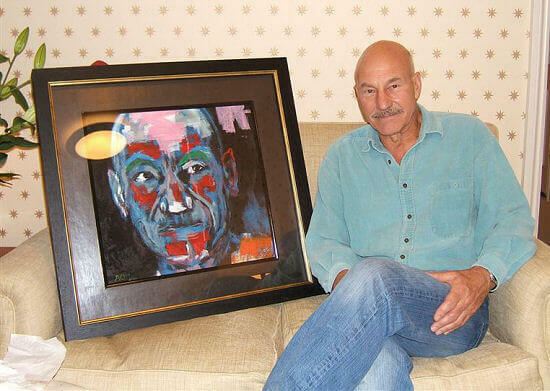 The painting represents year five of the man's sixteen-year sentence. After completion of the intitial image of the couple, the centre of the male figure was sawn out and moved to the right-hand side. The spontaneous wash of colour and flowing lines of this work are also inspired by the music I was listening to whilst painting it: the captivating Riflesso sull'arco by Richard Rijnvos. 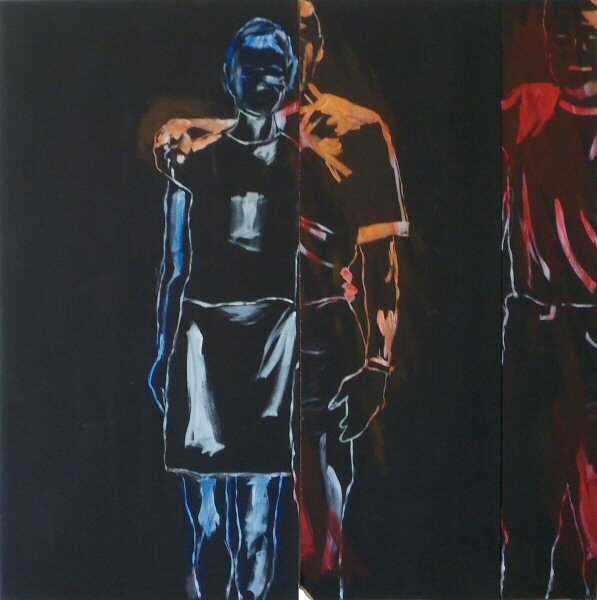 For more about this painting and the entire project visit the dedicated Sentence Project Page. This portrait represents art as literary criticism. Throughout 2011 I was one of seven members of The Telegraph Book Club. Our monthly discussions were featured in articles in The Telegraph newspaper written by Genevieve Fox. For every meeting I created an artwork. 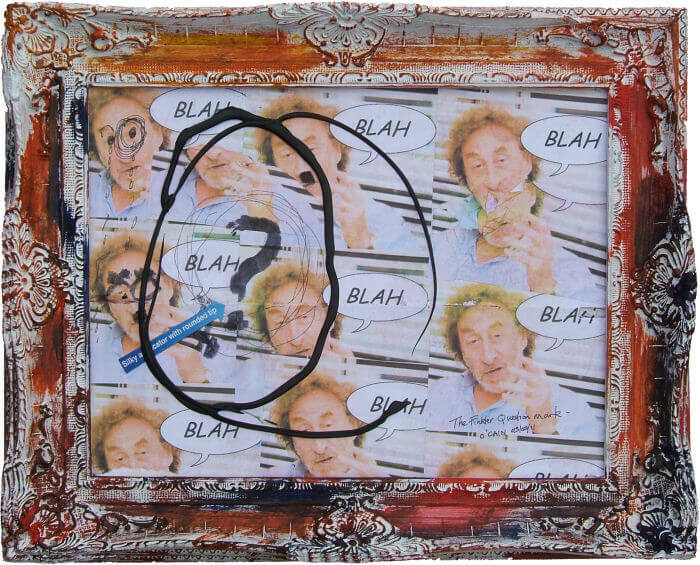 This painting/collage is my response to The Finkler Question by Howard Jacobson. I offer no clues as to my opinion of the book but say here wholeheartedly this is one of my favourite visual works. Thank you Howard Jacobson for the inspiration. 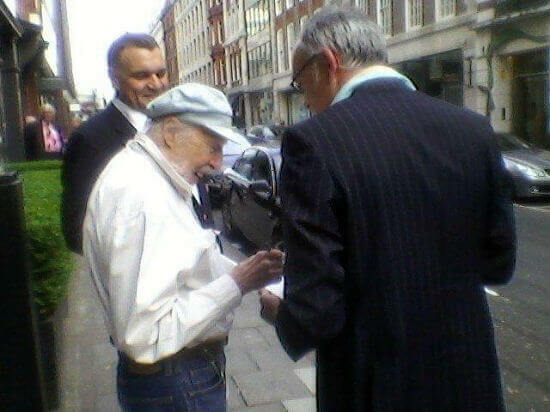 In Spring 2010 I had a chance to meet the legendary Pop Artist Richard Hamilton. To celebrate the occasion I created a poetry collection for him, bound into a handmade book. The cover incorporated this drawing, a mischievous homage to Hamilton’s reputation-making 1956 collage Just What is it That Makes Today’s Homes So Different, So Appealing? That collage was the first artwork to incorporate the word “Pop” into the composition, on a giant lollipop held by a bodybuilder. 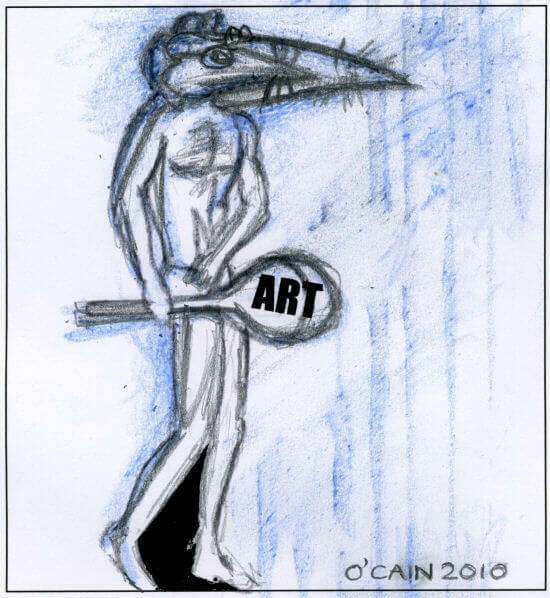 I have completed the phrase in my work with the alternative word “Art”. 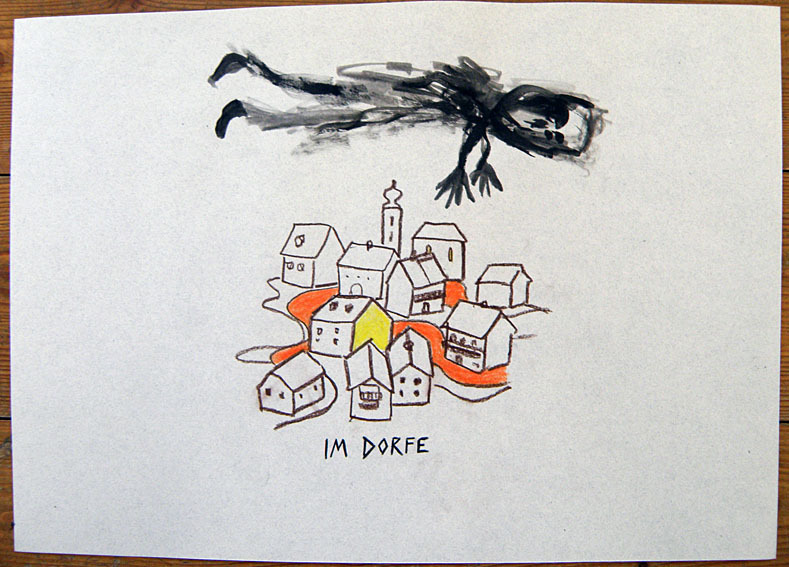 December 2009: "I work by the studio window. Outside the snow has gone. Uniform grey blankets all. We are in the eternal twilight between Christmas and New Year, between Edvard Munch's December birthday and his January death. I'm staring at the board on which I'm working, three foot by two. I'm attempting to create an image of Edvard's sister Sophie from a family photograph taken in 1868. Sophie is aged six; in a few short weeks the mother sitting by her will be dead. Sophie's holding a peg-armed doll. And she's gazing straight at me. By aged fifteen she'll be dead too. So, I get to work and try to use my knowledge from teaching children to make her image look life-sized, and feel life-weighted: to make her skinny frame hang right in her ill-fitting smock; to make her clutch on the doll appear correct for one her age. And I want the brush and the paint to do the work, like Edvard would have done. Not any kind of agonized draughtsmanship, but an unconscious flow. I push some chestnut brown across her lips. One swipe, ending in a faltering droop. And there she is. The Munch genes are unmistakable. 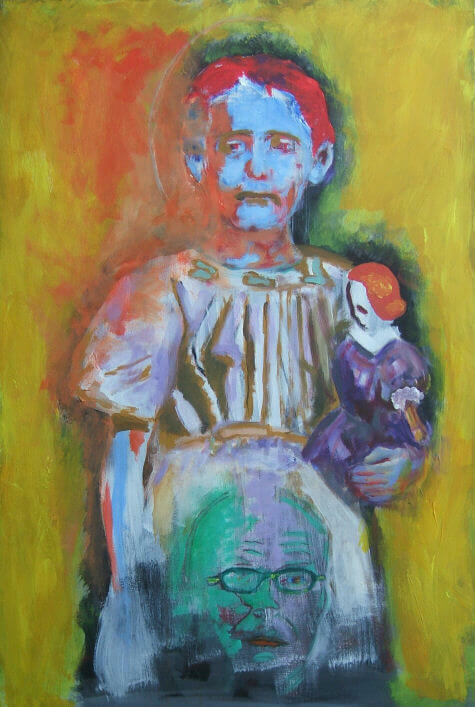 This could only be Edvard's sister looking at me, resolved from a hotch-potch of crude modern paint. In 1868 she stood still for the photographer, holding her doll. Photons bounced from her onto the photographic plate. And there she was locked as a smudge of black and white. Now she breathes again. She is reflecting coloured form into my eyes. Her long-gone chromosomes have transmuted into painted light." 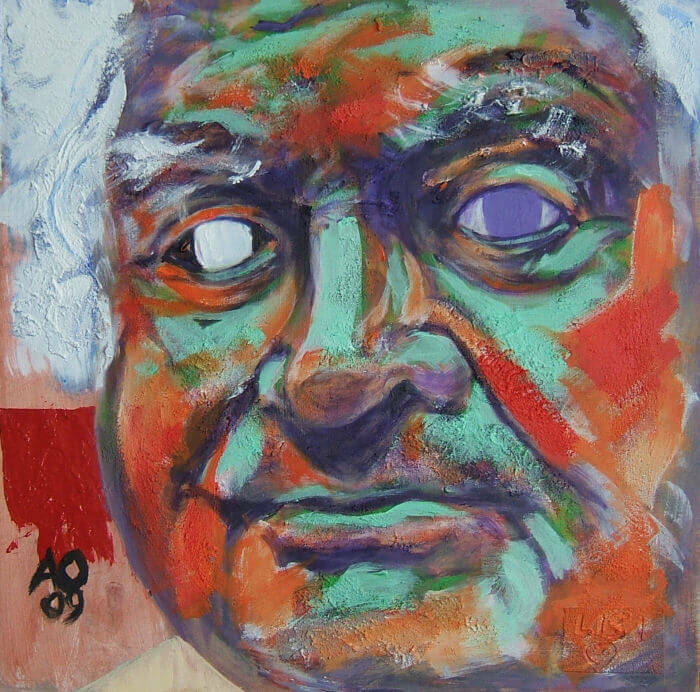 I created this work especially for film director Ken Russell from my own photographic studies. I wanted to capture the impish twinkle and movement of Russell's face in a still image. The white eye is part of that quest. Also, it reminds me of a projector lens emitting a round beam of intense light after the film has flipped from the end of its spool. "Who is this Gordon Character?" 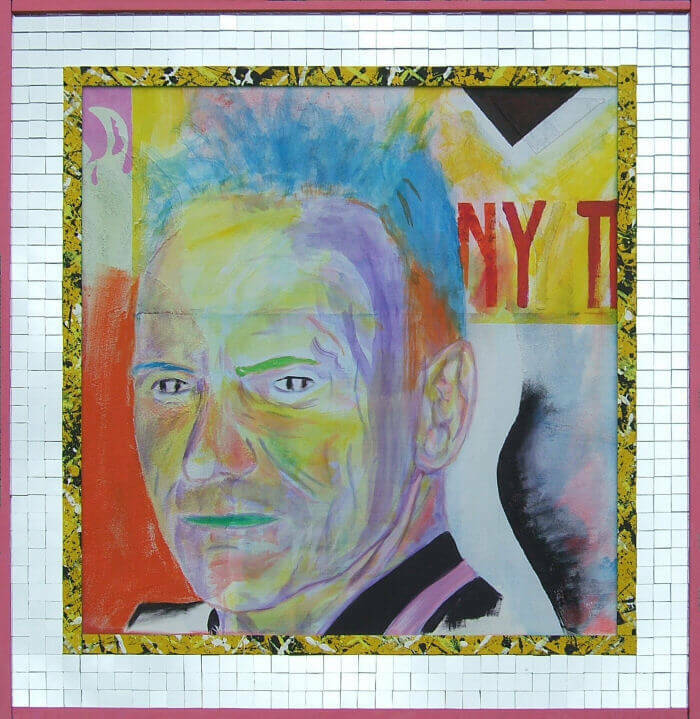 “My wife calls me Sting, my children call me Sting, who is this Gordon character?” Sting’s own words emphasizing the complete annihilation of his original persona. In this portrait I am interested in the nature of fame and identity. 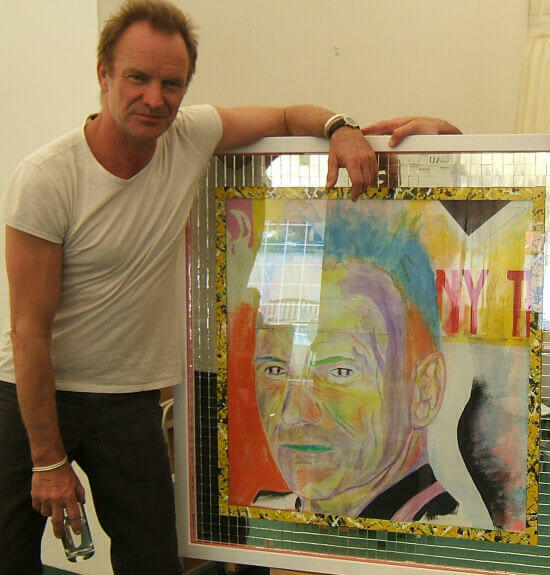 The painting incorporates a profile underpainting of Sting’s wife Trudie Styler. The image is surrounded by 432 mosaic mirror tiles (432 is the square root in miles per second of the speed of light). The title is painted onto the inner wall of the box-framing in mirror-writing so becomes legible reflected in the mosaic.The work was created as part of a collaboration with BBC Radio Wales. 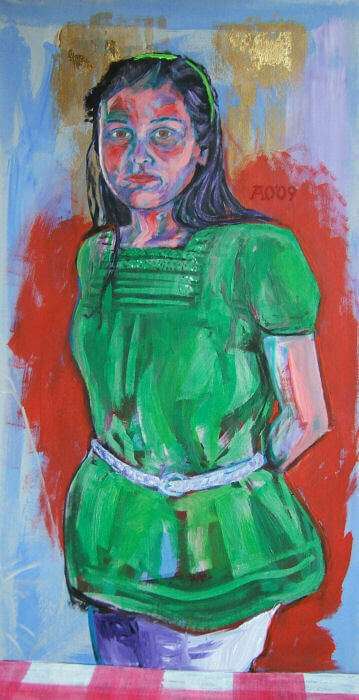 Here is a commissioned portrait from 2009. I'm drawn to the pensive yet determined gaze of Melis in this pose. 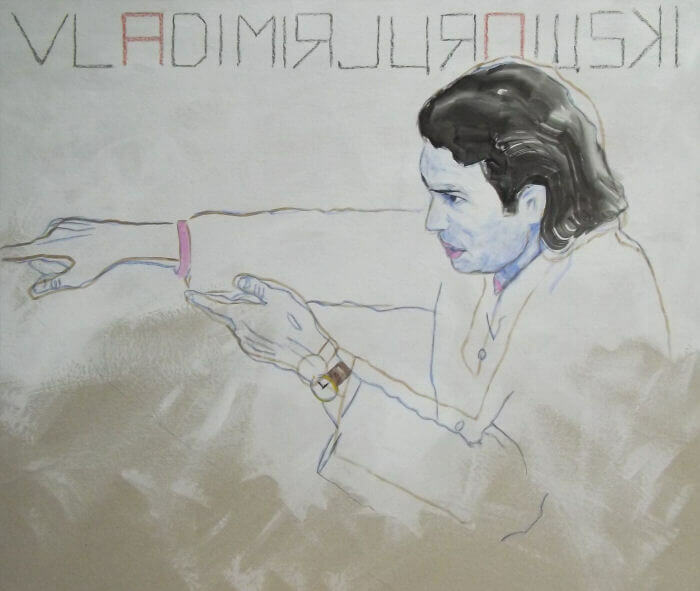 The work was commissioned by Melis' grandmother, who is present in this work as the merest outline of an elbow in white on the left. I am pleased with the sense of 3D form created solely from thick flat single brushstrokes. Whilst resident in Edvard Munch's preserved studio at Ekely, Oslo (see Art and Poetry Projects) I created many drawings. 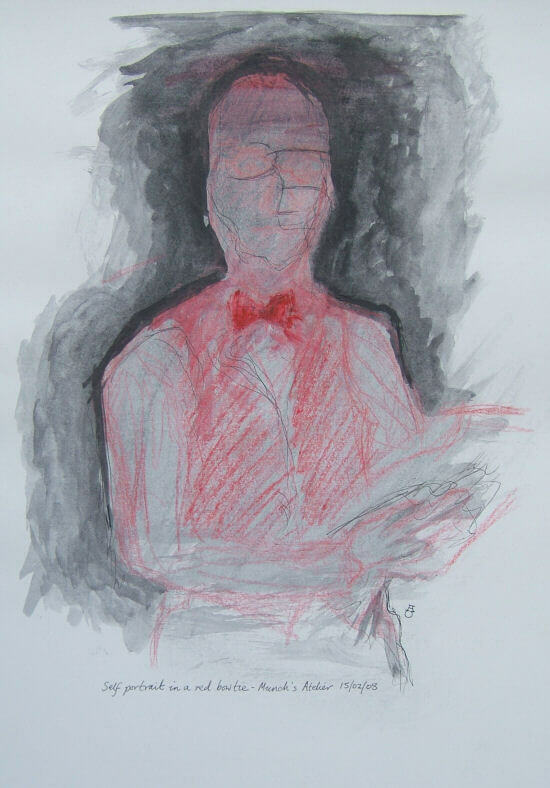 I choose to show this one, an image formed in a single intense burst of expressionistic self-observation. Munch's pledge to "write [his] own life" through his art has had a profound influence on my own practice. 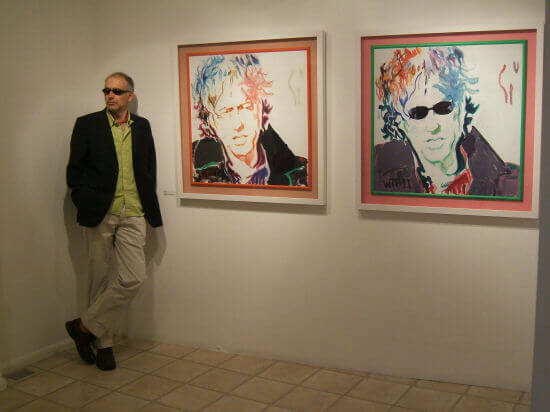 Most works I create contain either explicit or implicit autobiographical references (in the Sir Bob Geldof portraits below, for example, the sunglasses in painting II are not Geldof's designer eyeware but my own tinted high-prescription spectacles). 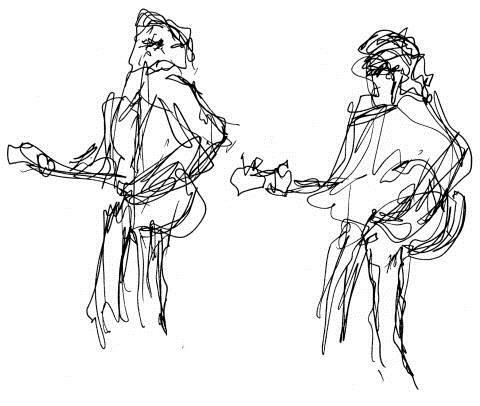 In 2007 I had a chance to attend a rehearsal by Sir Bob Geldof and his band and make sketches of Bob in action. I sat alone in the front row of the empty auditorium and immersed myself in the performance, pencils and pens working instinctively without me much looking at what I was producing. Throughout Bob played a tantalizing cat-and-mouse eye contact game, occasionally peeping out from behind his designer sunglasses. Using my sketches and frozen video footage I created the sumptuously-framed diptych above. The works are painted over sand and glue reliefs of guitar shapes: one positive, one negative. The project results from my captivation by magnetic charisma and the gathering of material in edgy circumstances. 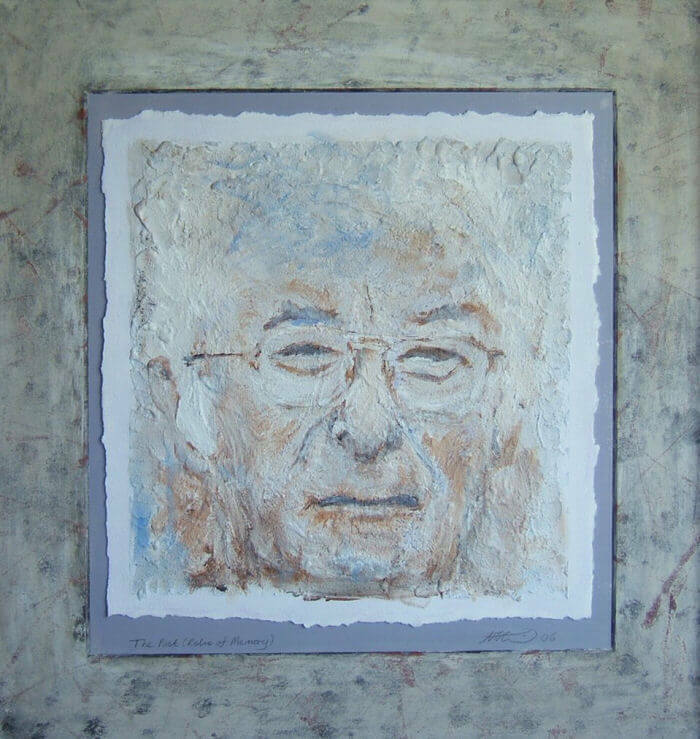 "It wasn't him, it never was"
I created this portrait to celebrate the one-and-only appearance of Nobel Laureate poet Seamus Heaney at the Hay Festival (May 2006). The central image is painted over an initial relief portrait sculpted using a knife and fork from sand and glue. That impasto mixture is laid onto delicate torn-edged watercolour paper. The mount is coloured using fragile, unfixed chalk, sealed hermetically into the final limed oak box frame. 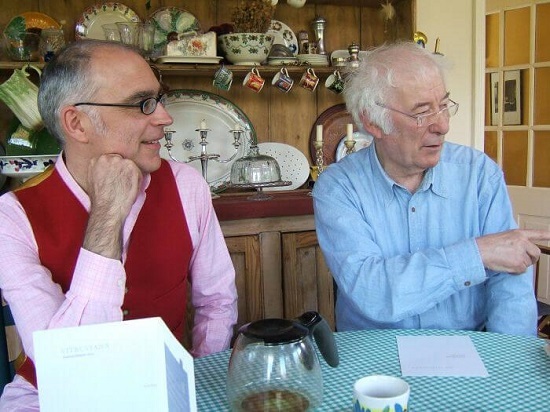 My aim was to conjure Heaney from raw geological resources, in keeping with the earthiness of much of his poetry. The title is from one of Heaney's poems. 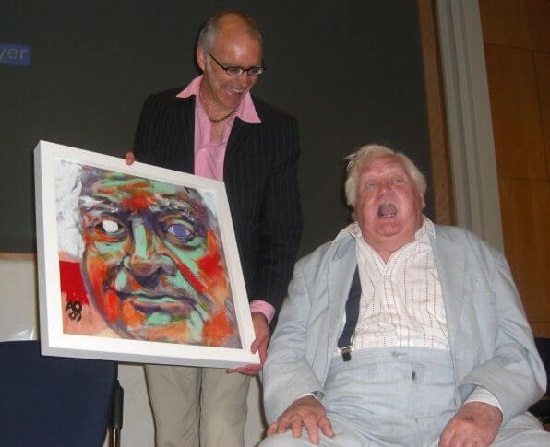 "I wish you ongoing rewards from your painting and will ever be appreciative of the honour you did me with the portrait".